The Isle of Man (Manx: Ellan Vannin) is an island in the Irish Sea, off the coast of Great Britain (of which it is a crown dependency). Douglas is the capital city. It also has a flag with a red background and 3 armoured legs joined together - "whichever way you throw us, we always land on our feet". Parliamentary democracy under constitutional monarchy. The Isle of Man is a Crown dependency. Foreign affairs, defence, and good government are handled by the British government, but in all other matters the island is independent. The Isle of Man Government is the executive and proposes laws to the legislature, Tynwald. Laws passed by Tynwald are given royal approval by the Lieutenant Governor unless the British Minister of Justice says they do not help the good government of the island. Map of the Isle of Man. The Isle of Man is an island in the Irish Sea, it is northwest of the European continent. It is between the United Kingdom and Ireland. The island is 22 km wide and 52 km long, it has a total area of 572 km². The Isle of Man has a total of 160 km of coastline, it has no important bodies of water. Apart from the island itself, the Isle of Man also includes some nearby islands. The most important of these islands are called Calf of Man, St Patrick's Isle and St Michael's Isle. The island's terrain is varied, it has mountains in the north and south. A valley is more or less in the center of the island, between the cities of Douglas and Peel. The northern part of the island is very flat. Snaefell is the Isle of Man's highest mountain, it measures 621 meters above sea level. It is said that you can see Scotland, England, Ireland and Wales from the top of mount Snaefell. The Isle of Man has a usually mild weather. Summers are cool and winters are mild and rainy. Rainfall is similar to that of the other British Isles. Elevated parts of the Isle of Man get more rainfall, especially mount Snaefell. The northern and southern parts of the island are not as rainy as the rest. The island's weather is normally cool. The highest temperature ever registered is 28.9 °C, in Ronaldsway. The Isle of Man is not very sunny, but it is less cloudy than other parts of the British Isles; strong winds around the island help keep clouds in constant movement. 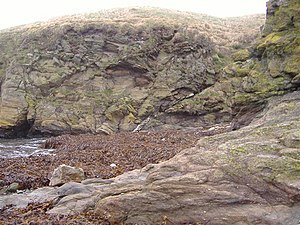 Geological fault at Niarbyl, Isle of Man. The narrow white diagonal line near centre of picture is the only remaining visible sign of the Iapetus Ocean. The geology of Man is notable for the Iapetus Suture, which runs almost unseen right through the rocks of the island. The suture is the remnant of a once huge ocean, the Iapetus Ocean, which was lost about 420 million years ago as three continents came together. The Isle of Man became separated from Ireland and the British Isles about 8500 years ago. The short period of time between the melting of glaciers and the rise of sea level allowed a small number of species to colonize the island by land. The island was heavily deforested in the Middle Ages, which weakened its environment. Some land is now protected by the government to help preserve its wildlife. Curraghs Wildlife Park, in the wetlands, is home to many species of animals and plants. The island is also home to a large number of bird species. A lot of the Isle of Man's plant life, or flora, is composed of shrubs (bushes) and other short plants. Several species of grass and moss also live there. Mosses on the island contribute to the formation of peat. There is peat in the island's wet areas. The island has heavily deforested in the Middle Ages. Common trees on the island include ashes, elms, pines, willows, and hawthorns. There are also other trees on the island, as well as many species of flowering plants. Bogs are home to ferns and orchids. The Isle of Man is home to a large number of bird and insect species. Many species live in "curraghs" (wetlands in the northeast of the island). Curraghs are protected by the Government of the Isle of Man. Curraghs Wildlife Park is in these wetlands, it is both a zoo and a protected area. During the winter, curraghs are the second largest nesting ground of the Hen Herrier in Europe. The Peregrine Falcon, Merlin, European Robin, Willow Warbler, Song Thrush, Dunnock, Swan and a subspecies of Winter Wren possibly native to the island also nest in the curraghs. The Chough is also in the Isle of Man, it is more common than in other parts of Europe. Some farming methods have decreased the bird population of the island. The Northern Lapwing is now rarely found, and the Yellowhammer is now extinct on the island. 18 species of butterfly and 250 species of moth also live on the Isle of Man. Most of them live in the wetlands during different seasons. ↑ "Island Facts". Isle of Man Public Services (www.gov.im). Retrieved 15 September 2011. ↑ "Income inequalities". The Poverty Site. Retrieved 21 April 2011. ↑ "Human Development Report 2010" (PDF). United Nations. p. 143 ff. Retrieved 21 April 2011. ↑ Geography: Physical Geography. Isle of Man Public Services (2010). Retrieved 3 June 2010. ↑ Travelling on the Snaefell Mountain Railway. Isle of Man Guide. Retrieved 30 August 2009. ↑ 7.0 7.1 Climate. Isle of Man Guide. Retrieved 3 June 2010. ↑ Creatures Great and Small - Cretooryn Mooarey's Beggey. Isle of Man Government (2010). Retrieved 3 June 2010. ↑ Tree Gallery. Isle of Man Woodland Trust. Retrieved 3 June 2010. ↑ Nature Trail. Isle of Man Government (2010). Retrieved 3 June 2010. ↑ Manx Wildlife. Isle of Man Government (2010). Retrieved 3 June 2010. ↑ Manx Bird life prepares to celebrate twelfth birthday. BBC (16 February 2010). Retrieved 3 June 2010. ↑ The Butterfly Trail. Isle of Man Government (2010). Retrieved 3 June 2010. Tynwald.org Hansards, Order Papers and Background to the Manx Government. Birching in the Isle of Man 1945-1976 Article about the use of the birch as a judicial punishment in the Isle of Man. Manx Notebook Manx History Archive.